Landlord group behind referendum campaign attempted to repeal city council’s vote on just-cause protections. A member of the Alameda Renters Coalition participates in a honk-and-wave campaign urging voters not to sign a petition being circulated around the city to repeal just-cause protections for renters. The battle for just-cause evictions in Alameda has gone from the ballot box to city-council chambers. Now, it’s a battle on the streets. After the Alameda city council approved protections against no-cause evictions earlier this month, paid signature-gatherers have been canvassing the city to potentially repeal the council’s vote and change the city’s charter. If successful, it would suspend what are called "just-cause" protections until the next election cycle. But those who have fought for just-cause — which prevents landlords from evicting tenants without reason — say the new campaign is fraught with misinformation, false claims, and wrongful impersonations. According to city documents, the committee behind the referendum is named “Alamedans in Charge – A Coalition of Rental Property Owners, Homeowners, Businesses and Tenants for Fair and Affordable Housing.” The sponsoring committee behind the group is the Alameda Housing Providers Association, a property-owner group against just-cause protections. Representatives from the housing association did not return a call for comment. “Their paid petition circulators are falsely claiming that the referendum is for ‘reasonable rent control’ and fair rents, even going so far as to impersonate members of the Alameda Renters Coalition,” ARC said in a statement to the media. The memo says to tell possible signees that voters are leading the effort behind it. And while its true that Alameda voters passed a landlord-written Measure L1 over the tenant advocacy group-written Measure M1 in November, only the latter included protections from no-cause evictions. “The extreme, activist-sponsored amendments to Measure L1 would make it nearly impossible for a landlord to evict drug dealers, prostitutes, and tenants engaged in other activity,” the memo states. The drug-dealers-and-prostitutes angle has been used by landlords before. Even with just-cause protections in place, the city’s website says a landlord can still lawfully evict a tenant for various reasons, including failure to pay rent, breach of a lease — including illegal activity on the property — nuisance, or failing to give a landlord access to their property. The petition states the signatures are for a referendum against the city council’s June 6 decision that includes rent increases, “limitations on evictions,” and payment of relocation assistance to applicable rental units in Alameda. The referendum calls for the council to reconsider or completely repeal the ordinance, which passed with a 3-2 vote. But members of ARC say this is a misrepresentation of the true intention of the referendum. Heather Reed, one of those members, says if people believe just-cause is infringing on landlords’ rights, they should by all means sign the petition. But, she says, people are being given incorrect information about what’s at stake and who is behind it. Reed was among many coalition members who have confronted signature-gatherers and asked voters if they knew the petition was to reverse just-cause protections. Many would-be signers said they were not told that’s what their signature would help undo. The ARC Facebook page has several videos of people confronting those signature gatherers outside various retail outlets across Alameda, including Marina Village, Trader Joe’s, and Lucky’s. In response, ARC launched its own campaign: “Stay calm. Don’t sign the petition.” This included a honk-and-wave campaign outside the Posey Tube on Thursday. 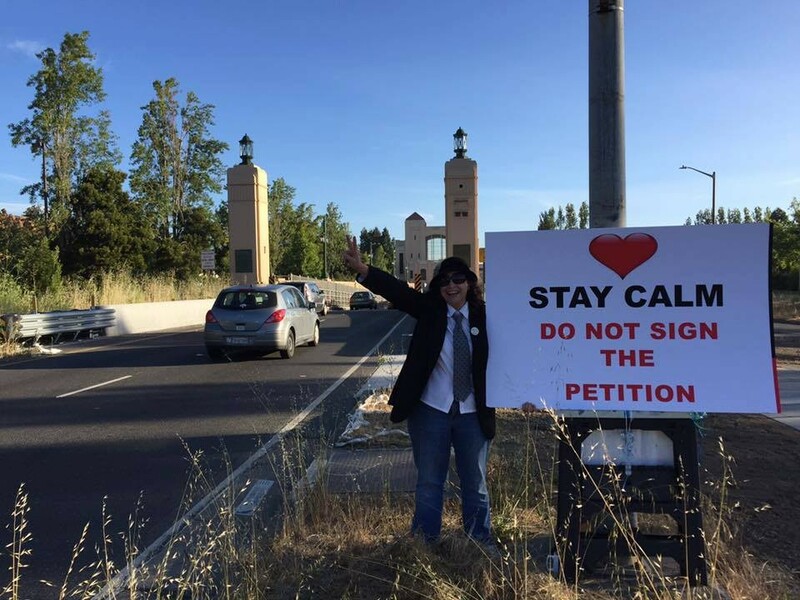 Alameda city clerk Lara Weisiger said the signature gatherers have until July 6, when the new ordinance takes effect, to get signatures from at least 10 percent of registered Alameda voters, or about 4,800 signatures. If they meet their goal, and the signatures are validated by the Alameda County Registrar of Voters, the Alameda city council would set the referendum up for the next election cycle in November 2018. This means no-cause evictions could continue until that vote next year. Some people said they mistakenly signed petitions, as they were told by signature gatherers that the petition came from the ARC. These individuals wanted to file paperwork to have their signatures removed. Weisiger said her office had received seven requests as of Thursday. Reed said that, signature-gatherers and landlord groups continue to disseminate untruthful information about the issue, it undercuts voters’ ability to have honest discourse. “The lack of confidence in their own cause should give people pause,” she said.